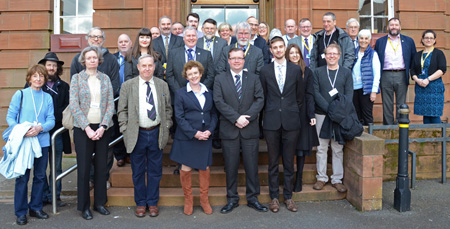 SCoJeC was honoured to be asked to provide a speaker to lead 'Time for Reflection' before the full Council meeting of Dumfries and Galloway Council on 28th March, when it was due to discuss adopting the internationally accepted definition of antisemitism. "That is why each of us, especially those in positions of power, have to take a stand against the corrosive power of hate. All it takes for hate to flourish is for good people to do nothing. Today, in this room, I see so many good people doing something, acting - and I am proud and honoured to be present." The motion about antisemitism was then proposed by Councillor Elaine Murray (Labour) and Councillor Rob Davidson (SNP) and was unanimously agreed by the Council by acclamation. As well as agreeing to include the accepted definition of antisemitism in relevant policies, the motion expressed concern at the rising number of antisemitic hate incidents in the UK, celebrated and expressed support for the Jewish Community in Dumfries and Galloway, and declared hatred, antisemitism, and discrimination against people for their beliefs, have no place in the community. The Council later issued a statement declaring that: "Dumfries and Galloway Council practices and celebrates equality and diversity and will not tolerate any form of discrimination, harassment, or victimisation. Antisemitism has no place in this Council, and whether this is expressed in speech, writing, visual forms, or actions, this Council will not stand for it." Leader of Dumfries and Galloway Council, Elaine Murray said: "I am alarmed at the rise in antisemitism in recent years across the whole of the UK, including four reported incidents in Dumfries alone. As part of the definition the IHRA provide guidelines, which will also be taken into account and, where any antisemitic discrimination has been found to have taken place, we will not hesitate to act." Councillor Rob Davidson, Depute Leader, said: "Our Council takes our obligations under the Equalities Act 2010 extremely seriously. By adopting the definition of antisemitism, this goes further and shows that our Council will not tolerate unlawful discrimination, harassment, or victimisation in any form and against any communities." Jewish Student Chaplain Eli Grunewald commented: "It was a great privilege to be asked by SCoJeC to represent the Jewish Community of Scotland at the meeting of Dumfries and Galloway Council where they unanimously agreed to adopt the internationally accepted definition of antisemitism. There are Jewish people in every part of Scotland, and it is good to see local authorities celebrating the diverse minorities within the local population, and recognising the need to provide a welcoming and supportive environment for all. "I really felt that the Dumfries Jewish community appreciated the Council's support. And although the UK and Scottish governments have already decided to adopt the definition of antisemitism, each individual council's decision to do so themselves is hugely important, and means so much to their local Jewish Community, and by extension, to the wider Jewish Community. With time, the more civic bodies that recognise the importance of this, the more effectively we can combat antisemitism and hate." A Council official added: "We had a wonderful turn out from the community and I hope we can build on that with engagement on all sorts of issues. I hope this is just the start of a new relationship with our Jewish Community that we will all our part to ensure we build on what we started today."